For some reason, the Oracle installer is having problem with long directory structures. To overcome this, you can simply copy the installtion directory to a location with a shorter path. 3) run the installer from the new location. This entry was posted in Oracle and tagged Oracle, Oracle Client, OUI has stopped working, Windows 2008 on March 17, 2009 by Asaf Tal. Even Oracle veterans may encounter some challenges when it comes to setting an odbc using the Oracle XE Client. 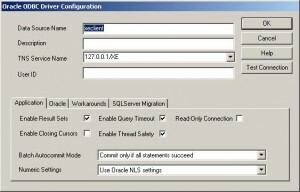 As every DBA will tell you, you will need to configure the tnsnames.ora (using net configuration Assistant or by going to oracle home\network\admin and edit it manually). After that, theTNS Service name in the ODBC will be populated with the entries from the tnsnames.ora file. You will only be required to choose the appropriate entry and you should be good to go. This was the case in all the latest Oracle releases However If you will download the Oracle XE client you will quickly discover that there is no tnsnames.ora under the Oracle client XE directory structure. In addition, the network\admin directory is not there as well. Oracle documentation explains (In their usual user friendly way) how to connect to the Data Base using a connection string (username/password@[//]host[:port][/service_name] where service name is usually XE and port is 1521) but it is not that obvious how to configure the odbc to use this. The solution is simple enough (once you find it). All that needs to be done is to type the connection string on the ODBC’s “ TNS Service Name” field. Just add the line 127.0.0.1/XE (no need to use the drop down) and test the connection. If the Data Base is on a different machine, you can replace 127.0.0.1 with the address of the remote server. 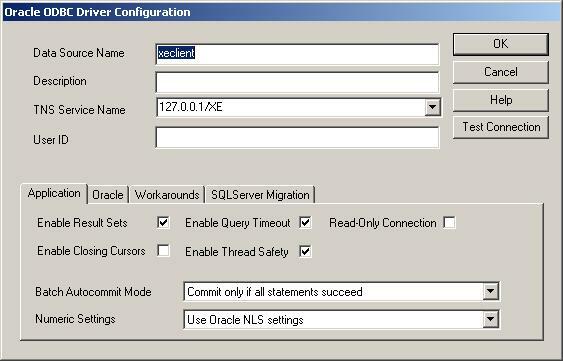 This entry was posted in Oracle and tagged Connection, ODBC, Oracle, Oracle Client, Oracle XE, Oracle XE Client on February 11, 2009 by Asaf Tal. This entry was posted in Oracle and tagged ORA-12638, Oracle, Oracle Client on November 6, 2008 by Asaf Tal.